What does the U.S. Navy’s first freedom of navigation operation near a Chinese man-made island really mean? The past 24 hours have kept the South China Sea at the top of the international news cycle. Leaks from senior U.S. officials on Monday noted that the U.S. Navy was about to begin long-awaited freedom of navigation operations (FONOPs) near China’s man-made islands in the South China Sea. Barely eight hours after those reports surfaced, we received confirmation that the USS Lassen, an Arleigh Burke-class guided-missile destroyer, accompanied by a P-8A Poseidon and P-3 Orion surveillance aircraft, transited within 12 nautical miles of Subi Reef in the Spratly Islands. Subi is one of seven Spratly features where China has, over roughly the past 14 to 16 months, carried out extensive island-building and construction activities. Satellite imagery published by The Diplomat in early September 2015 suggests that China is building a 3 kilometer airstrip on Subi. The Lassen‘s operation has kicked off a new era in the fraught and increasingly crowded maritime space of the South China Sea. In what follows, I outline a few important takeaways from Tuesday’s operation and what South China Sea watchers at The Diplomat should look out for in the South China Sea now that the United States has shown that it is willing to take on China’s excessive maritime claims in the Spratlys head-on. First–and this can’t be stressed enough–the FONOP does not alter where the United States stands on the sovereignty of individual reefs, rocks, and islands in the South China Sea. Indeed, U.S. policy on that issue stands where it was on Monday, before the FONOP: neutrality. As I noted in my earlier discussion of the Lassen‘s operation, the U.S. Navy is merely asserting that because Subi Reef, in its pre-artificial island state, was fully underwater at low-tide, it has no right to a 12 nautical mile territorial sea under the United Nations Convention on the Law of Sea (UNCLOS). Several reports on the FONOP have described this as the start of the United States challenging the legitimacy of China’s territorial claims. That’s simply not true (for an excellent legal primer, I recommend Mira Rapp-Hooper and Adam Klein’s post over at Lawfare). 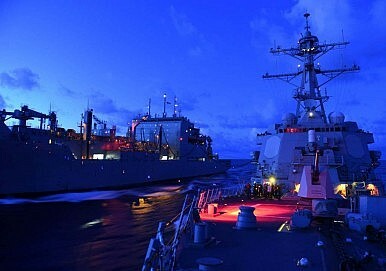 As the U.S. Department of Defense outlines in its summary of the FON program, which was a relatively mundane, off-the-mainstream-news radar activity before Tuesday, the operations push back against “maritime claims that the United States considers to be excessive.” While the United States still has not ratified UNCLOS, it behaves as if UNCLOS is the basis for customary international maritime law. Indeed, customary international law is another important aspect of why the U.S. FONOP mattered in the South China Sea. As Scott Cheney-Peters correctly noted at the Center for International Maritime Security, the FONOP ensures that China’s so-called land reclamation cannot convert the legal definition of a feature from a reef into an island, thus entitling features like Subi to territorial waters. Left uncontested, countervailing interpretations of international law could gain acceptance as customary international law. Even if most non-China South China Sea littoral states reject Beijing’s understanding of the status of these features, China’s position would be stronger if its excessive maritime claims remained uncontested. One of the more obvious takeaways of Tuesday’s operations is that U.S. allies and partners in the region have now seen evidence that the United States is willing to stand up for the values and principles it has emphasized in diplomatic joint statements for months now. For an administration that has long sought to reinvigorate a languishing and increasingly lethargic “Pivot” or “Rebalance” to Asia, ignoring the unprecedented speed and scale of China’s building along the critical sea lanes of the South China Sea would have been a grave mistake. Now that a U.S. grey hull has rejected China’s excessive maritime claims, the security conversations that U.S. diplomats will be having with their counterparts across maritime east Asia will begin on stronger foundations. China’s reaction to the FONOP is also telling for a range of reasons (you should read Shannon Tiezzi‘s thorough coverage of the Chinese reactions, both official and unofficial). First, the Chinese foreign ministry and ministry of defense have reacted with relative restraint. Given the United States’ decision to telegraph where and when the FONOP would take place, there was little chance that People’s Liberation Army-Navy (PLAN) ships in the vicinity of Subi Reef could have been taken aback. Even if that were the case, the crew of the Lassen are reportedly particularly adept in interacting with their Chinese counterparts under the April 2014 Code for Unplanned Encounters at Sea (CUES). The Chinese government is naturally catering to multiple audiences when it reacts to incidents like Tuesday’s FONOP. For international audiences, restraint will be a welcome sign that additional U.S. FONOPs won’t necessarily raise the risk of a potentially catastrophic kinetic exchange in the South China Sea (even if China has said the FONOPs simply reinforce its resolve to continue island-building and construction). However, we can’t forget that Beijing has to cater to a domestic audience that isn’t entirely apathetic to the issue of the South China Sea. Given that China has framed its claims in the South China Sea, including its ambiguous nine-dash line claim, in nationalist and “territorial integrity” terms, there is a strong nationalist backlash to the U.S. FONOP. As Foreign Policy notes, “Chinese social media voices are now mocking what many perceive as a spineless official response.” Of course, China isn’t a democracy and pressure on social media won’t affect the decision-making of the Central Military Commission, but continued restraint by the PLAN may not be on the cards for long if U.S. FONOPs are sustained in the Spratlys. Finally, where can FONOPs go from here and how possibly could China change its reaction? There are two things to look for with future freedom of navigation exercises. First, will the United States expand the exercises to include multiple vessels and possibly international partners? Second, how frequently will the United States assert high seas freedoms near China’s artificial islands in the Spratlys (at least, Mischief and Subi Reef)? I suspect Washington will invite its Southeast Asian partners to tag along shortly. Frequency will be up to the discretion of the administration and influenced by a range of factors, including the overall health of the U.S.-China bilateral relationship. China could have reacted to Tuesday’s operation in a range of ways. Some commentators had suggested that Beijing could have interdicted the U.S. ship. That would have sent a strong signal that Beijing would behave as if the 12 nautical miles around Subi were indeed territorial waters. This would also have made sense given earlier statements made by the Chinese, including an assertion by a foreign ministry spokesperson that China would “never allow any country to violate China’s territorial waters and airspace in the Spratly Islands.” Beijing’s reaction on Tuesday and its subsequent decision to describe the FONOP as a “threat” to its sovereignty instead as a “violation” thereof leaves room to maneuver. Ambiguity has worked to China’s benefit in the South China Sea before–indeed, Beijing has never stated in uncertain terms whether it considers Subi and Mischief Reef to possess “territorial waters” as UNCLOS defines them. I’ll end with a bit of trivia that captures the essence of what’s broadly at stake today in the South China Sea as tensions rise between China and the United States. October 27 just happens to be the United States’ “Navy Day.” What better way for Washington to recognize the important role of the U.S. Navy in ensuring that all seafaring states have access to important global public goods like the freedom of navigation and overflight than by staging its first FONOP to protest excessive maritime claims by China? The current contest in the Spratlys is, in no small part, about the enduring role of the U.S. Navy as the primary enforcer of the maritime commons in East Asia. China upped the ante when it began its unprecedented island-building and construction. The U.S. could have stood idly by an watched the status quo shift or it could have stepped in. It chose the latter.